But whether you’re the pregnant ‘maid or the bride-to-be, choosing a dress to accommodate an ever-changing belly can be daunting. Between the style, color, size, and the cut, there are a lot of factors to consider when choosing a maternity gown, and all of the options can be overwhelming. We know that being a bridesmaid and an expectant mom isn’t an easy combination! But we think that your growing body need not be met with growing anticipation about whether or not you and your bump will look fabulous in your dress! So to help you out, we’ve compiled a list of the 20 trendiest and most flattering bridesmaid gown options for all of the momma’s-to-be out there. First and foremost: the silhouette. It’s truly the kicker when it comes to finding that flawless gown that will have your pregnant ‘maids thanking you! Your best bet is the empire waistline, which cuts just below the bust and above the waistline to accommodate growing bellies. We all know that your stomach likely isn’t the only thing growing during pregnancy! Yes, I’m talking about the “ladies.” Choose a neckline that will flatter your bust, not over-accentuate it—we don’t want you drawing attention from the bride, of course! Veer toward necklines that provide support and structure to help you put forward your most confident self as you step down the aisle during the processional. We recommend pleated bodices, straps, or high illusion fabrics. There is nothing that a good pair of underwear can’t fix! When it comes to looking flawless, never underestimate the power of a good undergarment. Flowy and breathable fabrics will be your best friend during these upcoming months. Embrace it for this wedding ensemble, as well! How can you choose a size to order when you don’t know what your body will look like four or five months from now? Enter: your consultant. Easy advice: trust her! Likely, she will recommend that you size up a few notches—keep in mind that it’s always easier (and cheaper!) to take a gown in than to let it out. Just don’t fret! The Wedding Shoppe’s consultants are ready to help you find the right bridesmaid dress for that baby bump. Give your ‘maids the gift of confidence with After Six 6712, a stunning maternity gown that is sure to have them swooning! The deep sweetheart neckline appropriately accentuates their busts, while the off-the-shoulder tapered straps keep them secure and comfortable. Simple, elegant, and sophisticated, After Six 6639 is everything you’re looking for in a bridesmaid dress. The best part? It’s timelessness and simplicity allows for you to use it as a blank palette to curate different necklaces and hairstyles to create a look that’s uniquely yours! Perfect for the sophisticated and spicy bride, Alfred Angelo 7243 offers a unique one-shoulder strap option for expectant mommas! Looking for a shorter (and more danceable!) option? Check out 7243S—its knee-length sister gown! The empire waistline silhouettes of Alfred Angelo 7289L & S are perfect for pregnant bellies, but your ladies will love them because it makes them feel absolutely beautiful! They will adore the asymmetrically pleated bodices, which minimizes any flaws or imperfections. Another plus? They’re both available in two-tone to complement your wedding day color palette! If you’re in the market for a more sophisticated look then search no more! Allure 1334 is just what you’ve been looking for. The thick off-the-shoulder straps provide a regal and charming look, while the sparkling faux belt accentuates the empire waistline to sparkle with every movement that your ladies make on the dance floor. Add a pop of color to your bridal party by choosing Allure 1437 or 1441 for your maids to don on your big day! 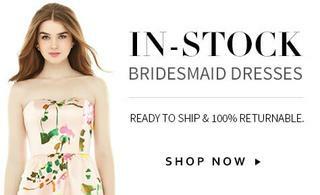 They’ll stand out in the floral pattern, while the flattering asymmetrical pleating across the bodice will have them looking flawless from the moment they step through the grandiose chapel doors all the way to the glamorous sparkler send-off! Whispering of timeless elegance and soft romance, Bary Jay 1452 is the perfect ensemble for your whimsical wedding soiree. Your bridesmaids will love this classic look from Bari Jay! Bari Jay 332 features a subtle sweetheart neckline and an empire waistline, accentuating their busts and giving them the perfect hourglass shapes. Bill Levkoff takes a classic look and gives it a modern twist with 1114. This stunning dress features a modified sweetheart-shaped bodice and a high neckline with sheer illusion fabric, keeping your ladies secure and stylish as they dance the night away! Timeless romance meets elegant sophistication in Bill Levkoff 1115. Between the delicate gathers, breathable chiffon fabric, and universally flattering A-line silhouette, you can’t go wrong with this gorgeous ensemble! Dessy 2844 is perfect for your romantic and whimsical wedding celebration! A sweetheart neckline, empire waistline, and off-the-shoulder sleeves—what more could an expecting maid ask for?! Modern, chic, and sophisticated, Dessy 2882 will send your ladies down the aisle in style and class! Another plus? The asymmetrical figure-flattering pleating. Bonus! The V-neckline and flattering asymmetrical crisscross gathers are the stars of this fabulous piece. Have each of your ladies don it, or mix-and-match it with Dessy 2882 or 2905 for a classic and refined look that is sure to make a statement! Crank up the romance with this charming piece from Dessy! Dessy 2905 features a sweetheart neckline with a one-shoulder strap, keeping your leading ladies secure and stylish! Give your future mommas the royal treatment with Dessy 2918! They will love the high neckline and delicate spaghetti straps, and the asymmetrical pleating provides a modern look that is sure to turn heads. You can’t go wrong with a classic and feminine look from Kennedy Blue. “Addison” features a sweetheart neckline and an inverted V-shape waistline accented by crisscross gathers, providing the perfect hourglass shape that will have your girls sashaying about the dance floor on a cloud of confidence and class! Sweet, feminine, and romantic, you can’t go wrong with a stunning ensemble like Kennedy Blue Brynn. Kennedy Blue Jodie and Lana are unique and beautiful options for your big day! A bloused bodice gathers at waistline to provide the perfect shape while keeping your maids comfortable and stylish. The perfect combination! Kennedy Blue Layla is the ultimate mixture of romance and charm. Style it with a loose up-do and sparkling earrings for a feminine and amorous look! Say “I do” to Kennedy Blue’s Quinn! Your expecting ladies will love the asymmetrical gathers on the scoop neckline, accentuating their best parts while minimizing any flaws. Which fabulous ensemble are you planning on asking your pregnant bridesmaids to don on their walk down the aisle? Let us know in the comments below! Oh, one last tip: ROCK THAT BUMP!